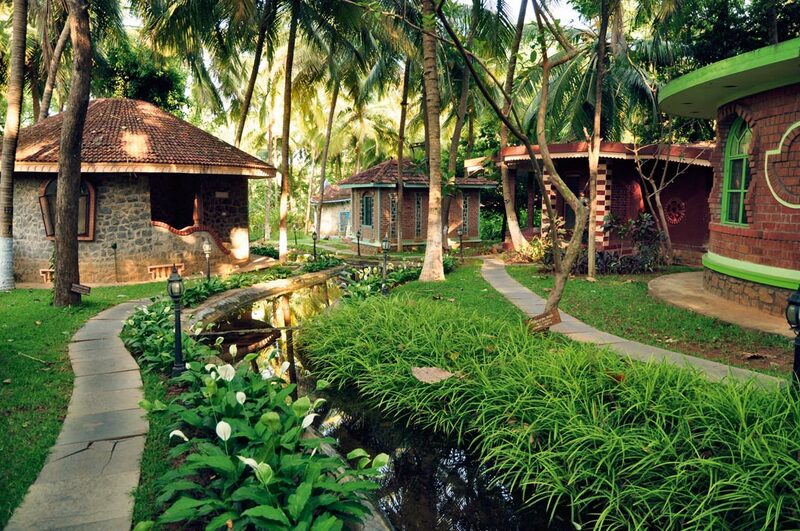 When an opportunity crops up for a visit to the Kairali Ayurvedic Healing Village in Palakkad, Kerala, I am at once both excited and a tiny bit apprehensive. Shockingly, I’m a novice when it comes to Ayurveda and am besieged by visions of being immersed in murky sludge. Nevertheless, I pack my bags and an open heart and set off to Coimbatore, the nearest city with an airport. As we drive through the unseasonal shower, I find myself marvelling at the plenteousness of the tones of green presented by the lush landscape. The verdant scene is dotted with tiny, brightly painted homesteads, no two of which are precisely the same shade. A little over an hour of observing why the state is called ‘God’s own country’, and we arrive at the healing village, where I’m greeted with a little ritual and incredibly sweet coconut water. Each of the villas is unique in its construction, and named after a star, and placed next to a water body. I’m glad for the map in my room, for I’m sure to lose my bearings. I make my way to the health centre for an appointment with the Ayurvedic doctors. I am questioned to figure out my dosha, after which cooling foods are prescribed for me. I also receive guidance in my choice of beauty rituals and massages. I ask the doctor for something to get rid of a pesky skin condition on my ankle, and frequent application of Jatyadi Ghritam, a ghee-based skin tonic, is recommended. I clutch my prescription slip with some skepticism as I make my way over to meet Gita Ramesh, one of the managing directors. At dinner, I notice that most guests choose to sport free-flowing clothing, which makes me comfortable enough to stay in my kaftans for the rest of my visit. My vegetarian meal includes soup and a gourd preparation, and is served with pink-tinged warm jeera water, flasks of which are kept constantly replenished. After a restful slumber, I awaken to a breakfast of juice, fresh fruit and deliciously fluffy idlis, after which I proceed to the health centre. I am guided through the women’s wing of the health centre by an attendant in a traditional mundu. I can’t quite figure out where to find the usual microfibre disposable underwear, and realise that the little handkerchief is actually a loin cloth. I have my feet cleansed and then clamber up onto the wooden slab, shyly surrendering the cloth wrap, along with a significant portion of my modesty. Used to the deep, soothing motions of my favourite Swedish therapies, I’m ill-prepared for the long, energising movements that constitute an Ayurvedic massage. Two Kairali-trained therapists work on you at the same time, smoothing oil over your body with brisk strokes, twice, before turning you over. I almost slide off the oil-slick bed as I flip around. I also experience a soothing treatment – Netra Dhaara, where a cooling liquid is dripped into my opened eyes. Then I’m scrubbed down with a coconut exfoliant, twice again, before a quick head massage. A mix of amla and curd is then applied to my hair, after which my head is wrapped in a banana leaf, before I move onto the wooden bed, to be coated in a body mask and left to my own devices. I drift off for a bit and just as I’m getting a little chilled, I’m escorted to be steamed. I tend to hate steam rooms, feeling faint and light-headed quite easily, but the wooden cabinets are a pleasant surprise. I climb into one, with my head – banana leaf et al – protruding from the top and proceed to sweat through the body mask. I am then whipped to the showers where I look at the green mixture presented to me with the greatest disbelief – there’s no way it can rid my body of the litres of oil it has just been subjected to, but it works to thoroughly cleanse my body and the Kairali Orange Blossom Shampoo, a pet project of Ramesh’s, does the same for my hair. I walk past the sounds of the meditation room, and everyone I encounter comments on the instant glow. The rest of my stay involves more brisk massages, a lot of showers, and what seems like every kind of gourd known to man. It’s a wrench to return to normal life and constant network coverage, but I carry along a bottle of shampoo and The Ayurvedic Cookbook by Ramesh, to make it a little less painful. While I might not be a complete convert to the ways of the Ayurvedic life – I enjoy butter chicken a little too much – I’ve found the Jatyadi Ghritam indispensable and can’t stop recommending it to friends.